Another dirge-like theme that feels like a deliberate throwback after the last two contemporary tracks. Gladys Knight’s vocals are strong but the song is a little sedate, especially for a Bond movie as unconventional as Licence to Kill. Underwhelming but not without merit. Felix Leiter’s back and is now DEA instead of CIA, meaning that he’s on the hunt for drug lords even on the day of his wedding (conveniently located in Miami). 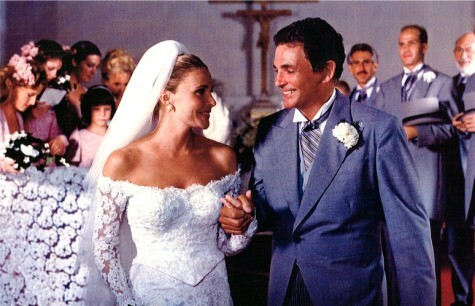 Leiter’s portrayed by David Hedison (for the 2nd time following Live and Let Die) and along with his best man James Bond, they take down notorious drug kingpin Franz Sanchez (Robert Davi) in an opening that sees Bond dangling from a helicopter, followed by he and Leiter parachuting into the wedding in full tuxes. Leiter and his blushing bride – what could go wrong? Of course Sanchez doesn’t stay locked up for long, and after a spectacular escape he wreaks revenge on Leiter by killing his bride and feeding Felix to a shark. It’s unusually violent for a Bond flick, although the gallows humour is still there in the note attached to a dismembered Felix: “He disagreed with something that ate him”. Leiter survives (barely) and Bond is set on a path of bloody revenge in a movie that pays homage to Japanese samurai films by having Bond dismantle his enemy’s empire from within. Licence to Kill certainly doesn’t lack for action, with much of it being some of the most queasily realistic of the entire series. Robert Davi is coolly competent as Sanchez (sporting a cool shoulder iguana! 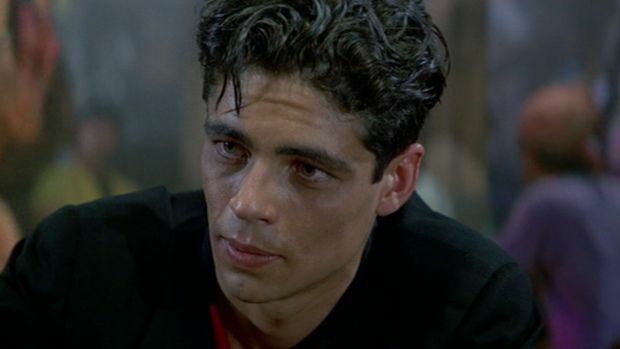 ), and he’s got a ruthless American counterpart named Krest (Anthony Zerbe) and a psychopathic henchman Dario (a young Benicio Del Toro) to help him wreak havoc. Much of the action is Bond put into Miami Vice-like scenarios (drug busts, cigarette boat races, and gun fights with uzi-toting thugs). The hand-to-hand fights scenes are bone-crunching and certainly earn Licence to Kill its violent reputation. People are fed to sharks, Bond is beaten and nearly broken, and Del Toro’s Dario death is particularly violent – he’s dropped into spinning blades and splatters into red mist. The climax of the film and a high point in stunt choreography is the lengthy tanker truck chase that Licence to Kill ends on. Bond, more a lone wolf here than ever, takes on Sanchez’s force in an amazing truck that can drive on two wheels seemingly at will, helping it to avoid RPG launchers. It’s ridiculous as ever, but technically impressive nonetheless. Bond shares nearly equal screen time with two female characters. Carey Lowell plays Pam Bouvier, a CIA informant and more traditional Bond Girl who helps Bond get close to Sanchez. It’s clear that Bond will end up with her, but the filmmakers play coy by adding Talisa Soto’s Lupe Lamora into the mix. Lupe is Sanchez’s girlfriend but takes a liking to Bond and seems to want to escape her life of crime, while Pam is a capable sidekick to Bond who’s also horribly boring. Lupe’s the more interesting character, despite being played by a very green actress. Bond tries to have it both ways by romancing each and the movie itself seems confused as to who Bond should end up with. The end has Bond first kiss Lupe and then drag Pam into the pool right before a fade to black. Dalton’s Bond is mostly heartless though, far more competent at action than romance. He chides Pam (who’s accompanied him to Mexico and is posing as his assistant) by saying: “It’s a man’s world south of the border. If you’re going to be my secretary, you better look the part. Here – buy yourself some decent clothes.” What a romantic. Dalton’s second (and final) outing is riddled with cliches (the lone wolf Bond out for revenge) and full of unseemly violence. And while it often doesn’t feel like a Bond film (producers wanted a “ripped from the headlines” feel and also shot it all outside of the U.K.), it still provides intermittent thrills and an increasingly complex storyline. In a series that often struggles with balancing tone, it may push too far into bleakness but is a solid tale nonetheless. It’s interesting to speculate where Dalton would’ve taken Bond next, but a years-long legal battle between Bond’s owners and Dalton’s supposed decision not to return would prevent audiences from knowing what that would’ve been.